"GEG" redirects here. For the Geg Albanian dialect, see Gheg Albanian. Spokane International Airport (IATA: GEG, ICAO: KGEG, FAA LID: GEG) is a commercial airport approximately 5 miles (8 km) west of downtown Spokane, Washington. 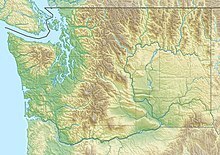 It is the primary airport serving the Inland Northwest, which consists of 30 counties and includes areas such as Spokane and the Tri-Cities, both in Eastern Washington, and Coeur d'Alene in North Idaho. The airport's code, GEG, is derived from its airfield's namesake, Major Harold Geiger. As of 2015, Spokane International Airport (GEG) ranks as the 70th-busiest airport in the United States in terms of passenger enplanements. At 3,998,272 total passengers served in 2018, it is also the second busiest airport in Washington. GEG is served by six airlines with non-stop service to 15 airports in 13 markets. It is included in the Federal Aviation Administration (FAA) National Plan of Integrated Airport Systems for 2017–2021, in which it is categorized as a small-hub primary commercial service facility. In 1943, General Hap Arnold established the first formal fire protection training course at Geiger Field, Washington. It was used until 1946. Geiger Field was served by a rail connection to the Great Northern Railway. It became Spokane's municipal airport in 1946, replacing Felts Field, and received its present name in 1960, after the City of Spokane was allotted Spokane Geiger Field by the Surplus Property Act. The airport code is still GEG, for Geiger Field. The current Concourse A and B complex opened in 1965 and was designed by Warren C. Heylman and William Trogdon. Occasional non-stop flights to southern California since the 1970s have been among the first to be suspended during economic downturns. A second level was added to Concourse A and Concourse B in 1974. The airport has a Master Plan, which includes a third runway and gates added to Concourse C.
A new control tower has been built south of the airport, replacing the one near Concourse C. The new control tower is the tallest one in the State. The Terminal, Rotunda, and Concourse C Enhancement Project (TRACE) was recently completed, designed by Bernardo/Wills Architects, P.C. The project, which concluded in November 2006, added retail space and expanded security checkpoints in the airport's three concourses, and gave the Rotunda an aesthetic renovation. In 2010, 2000 feet was added to Runway 3–21, and parallel taxiways 'A' and 'G' enabling heavier aircraft departures in summer months. The airport plans to add another concourse in the next 5–10 years and looks to add more direct flights to the east coast; the Spokane market has been hosting big events and attracting business to the area. Runways and terminals at Spokane International Airport. Note that runway 8/26 has been incorrectly labelled 7/25! The passenger terminal facility at Spokane International Airport has three main structures; Concourse A and B in the center, Concourse C to the southwest, and the Ground Transportation Center to the north. The three structures are immediately adjacent and connected, however the two concourse structures are not linked with an airside connector on the sterile side; as such, connecting passengers need to transit between Concourse A-B and Concourse C through the landside, non-sterile circulation. Entrance to the Concourse A-B ticketing area. The 1965 Concourse A-B complex includes the two concourses linked by a central rotunda area with dining and shopping vendors. The 37,000 sq ft (3,400 m2) rotunda is supported entirely along its perimeter and features no obstructions. Concourse A houses 5 gates (11-15), while Concourse B houses 8 gates (1–8). The Concourse A-B complex originally opened on April 1, 1965 and was designed by Warren C. Heylman and William Trogdon. The new terminal cost a reported US$4,600,000 (equivalent to $36,570,000 in 2018) and was dedicated on May 8, 1965, in a ceremony attended by Senator Warren Magnuson and Civil Aeronautics Board chair Alan Boyd. Designed to the Neo-Expressionism style, the building's architecture prominently features exposed concrete as well as distinct sculpted and monolithic architectural shapes and forms. However, as the airport has continued to incrementally expand, some of the original architectural intent of the Concourse A-B complex has been lost. While several expansions to the concourse extended the building's original architectural style, other additions have altered it. In 1974, a second floor was added to both Concourses A and B to allow for the implementation of passenger boarding bridge access to aircraft. The new floors, while sharing some material commonality with the original Heylman and Trogdon concourse, lacked the same curvy and sculpted neo-expressionistic forms. The later additions of the ground transportation facility and Concourse C to the ends of the concourse building further altered the architecture by replacing its distinct bookend elevations and entrances with corridors to the adjacent buildings. Interior renovations in the mid-2000s also replaced many of Concourse A-B complex's original sculpted forms and monolithic materials with more rectilinear forms and contemporary finish materials. Despite this, many of the original architectural elements remain integral to the space (such as the exposed concrete roof trusses and concrete columns), creating a juxtaposition between the newer elements and the original architecture. Under the proposed Terminal Renovation and Expansion (TREX) program to accommodate projected growth, the separate baggage claim areas in Concourse A-B and Concourse C would be consolidated into a single baggage claim with five carousels, and A-B would receive a renovation. Ultimately, operations at A-B would wind down under long-term plans to construct a new terminal in 2030, at the earliest. Southwest Airlines is the current primary occupant operating in and out of Concourse A. Delta and United Airlines both operate in and out of Concourse B. American Airlines operated in and out of Concourse B before relocating to Concourse C in March 2016. Concourse C houses 9 gates, both upper (30-32) and lower (21a, 21b, 22-26). The lower level gates house regional turboprop jets, while the upper-level gates house narrow-body aircraft. The current iteration of Concourse C opened in 2000 after a $20 million redevelopment and expansion project, designed by Bernardo-Wills Architects. The project, which broke ground in 1998 added 80,000 square feet (7,400 m2) to the concourse including a new baggage claim and two-story passenger facility. The 11,000-square-foot (1,000 m2) concourse was remodeled into service and operations functions. The new Concourse C has a more contemporary architectural style, contrasting the appearance of the Concourse A and B complex, by employing a large use of metal cladding and large curtain window walls on its exterior building envelope. However, it draws inspiration from its neo-expressionist neighbor by architecturally expressing a modular, repetitive, and exposed structural grid through its façade and interior lobby areas. Alaska Airlines and its sister carrier Horizon Air were the primary occupants operating in and out of Concourse C after Frontier Airlines ceased operations to Spokane in January 2015. However, that changed once American Airlines relocated to Concourse C in March 2016. 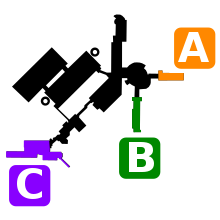 Alaska and American operate in and out of the upper-level gates, while Horizon operates in and out of the lower level gates. Spokane International Airport is served by 6 carriers. These carriers serve 13 markets through non-stop service to 15 airports. Delta Connection Bombardier CRJ-700 taxis to Concourse B Gate B6. United Express Embraer 170 begins taxiing for departure. Delta Air Lines Boeing 757 seen at Concourse B Gate B8. Spokane Transit operates two stops at Spokane International Airport, with bus route 60 connecting the airport to Downtown Spokane. Transfer opportunities are available in downtown to the rest of the STA system. The airport is also served by the WSDOT's Travel Washington Gold Line, which provides twice-daily bus service to cities north of Spokane, including Deer Park, Chewelah, Colville, and Kettle Falls. A consolidated rental car facility is located adjacent to the Ground Transportation Center on the north end of the main terminal. The consolidated facility opened in November 2008, replacing several satellite operations, and is intended to meet passenger growth at the airport for 20 years after its opening. On January 21, 1981, a Beechcraft Model 99A, Cascade Airways flight 201, crashed into a hill 4.5 miles from the runway. The accident was caused by an incorrect distance measuring equipment frequency and premature descent to minimum descent altitude. Of the nine people on board, seven were killed (including both pilots), and the other two passengers were seriously injured. The airline ceased operations about five years later. On March 18, 1994, Douglas DC-3C N3433Y of Salair crashed shortly after take-off on a cargo flight to Portland International Airport. The starboard engine failed shortly after take-off. The engine that failed had previously been in long-term storage and had been overhauled the previous year and fitted to the aircraft on February 21, replacing an engine that developed a misfire and loss of power. It had accumulated 15 hrs flight time at the time of the accident. The aircraft was destroyed in the subsequent fire and both crew members were killed. ^ a b FAA Airport Master Record for GEG (Form 5010 PDF), effective May 25, 2017. ^ "Spokane Intl Airport – Home" (PDF). ^ "Calendar Year 2015 Passenger Boardings at Commercial Service Airports" (PDF). Federal Aviation Administration (FAA). Retrieved February 27, 2017. ^ "List of NPIAS Airports" (PDF). FAA.gov. Federal Aviation Administration. Retrieved April 29, 2017. ^ "Spokane Intl Airport – Home". ^ "Historic Preservation: Mid-Century Modern Architecture". ^ "Terminal Roof Bid Accepted". The Spokesman-Review. Spokane. August 25, 1977. p. 7. Retrieved January 22, 2015. ^ a b "New Airport Dedication Will Feature Alan Boyd". Cheney Free Press. April 9, 1965. Retrieved August 19, 2017. ^ Deshais, Nicholas (July 10, 2016). "Warren Heylman's architectural vision 'all over' Spokane". The Spokesman-Review. Retrieved August 19, 2017. ^ "New Terminal for Airport Opens Today". The Spokesman-Review. April 1, 1965. Retrieved August 19, 2017. ^ Prager, Mike (July 19, 2017). "Spokane Airport eyeing major improvements". The Spokesman-Review. Retrieved August 19, 2017. ^ "Concourse C Addition & Remodel, Spokane International Airport". Bernardo-Wills Architects. Retrieved August 19, 2017. ^ Cain, Chad (April 9, 1998). "Airport projects set to take off". Spokane Journal of Business. Retrieved January 15, 2016. 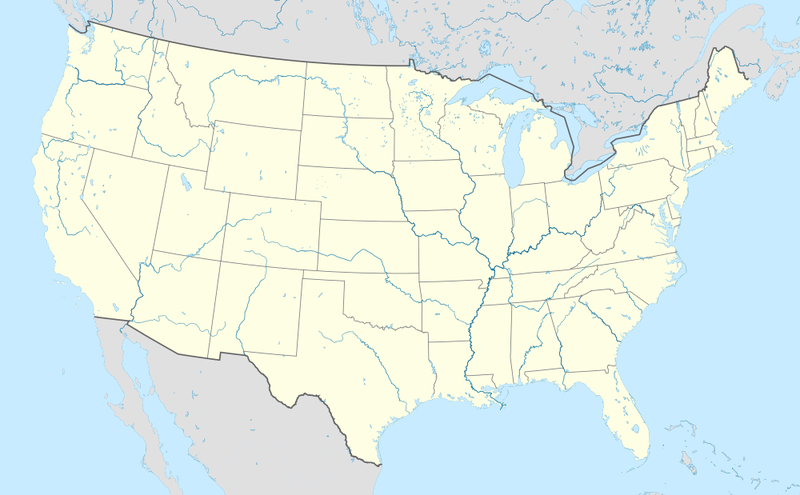 ^ "Frontier Airlines ending service at Spokane International Airport". Spokesman Review. Retrieved March 30, 2016. ^ "RITA - BTS - Transtats". Bureau of Transportation Statistics. Retrieved March 23, 2019. ^ "Spokane Intl Airport – Passenger Data". ^ Historic Passenger & Cargo Data. Retrieved on Mar 28, 2015. ^ Prager, Mike (November 12, 2008). "Car rental a short walk away". The Spokesman-Review. Retrieved January 14, 2016. ^ "N3433Y Accident description". Aviation Safety Network. Retrieved June 25, 2010. ^ "SEA94FA085". National Transportation Safety Board. Retrieved June 28, 2010. Wikimedia Commons has media related to Spokane International Airport. Italics denote projects which are planned, under construction, or otherwise not operating at the present time.